The system that receives and transmits the stimulus, to and from the brain is called the nervous system. The cell that transmits the message one part of the body to the other part is called nerve cell or neuron. 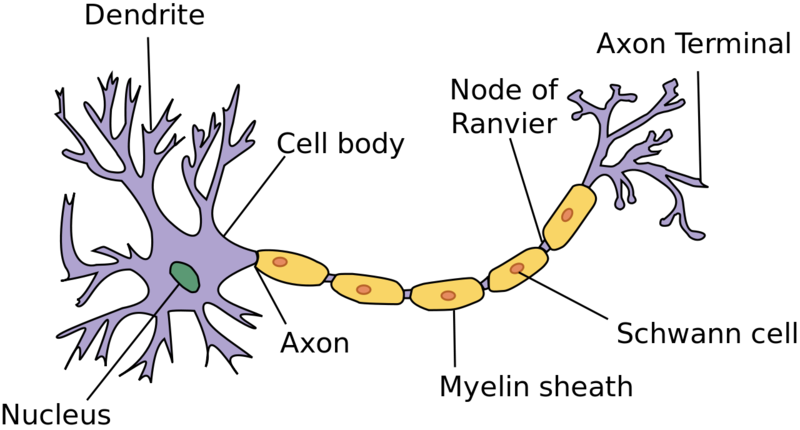 A neuron is divided into three parts cell body, axon and dendrites. Cell body is the main cellular part of the neuron. All the protein synthesis occurs in cell body. Axon is the longest extension arising from thecell body. It carries electrical impulse away from the cell body. Sometimes the neuron has insulation sheet called myelin associated with it. Those neurons are called myelinated nerve cell. It increases the velocity of the impulse carried by the nerve. These type of neuron found in theperipheral nervous system. Dendrites are the short but numerous extension arising from the cell body. They carry impulse from other neurons into the cell body. Afferent or Sensory nerve: They carry impulses from various parts of the body to the brain or spinal cord. Motor nerves enter into muscle. Secretary nerves enter into various glands. Vasomotor nerves control blood vessels. Mixed nerve: Sometimes axons of both motor and sensory neurons form a nerve which is called motor nerve. All the spinal nerves are mixed types. Autonomic nervous system (ANS): consist of ganglia and subganglia in organs. The system that receives and transmits the stimulus, to and from the brain is called nervous system. The cell that transmits the message one part of the body to the other part is called nerve cell or neuron. There are three types of neuron on the basis of work performed by them. They are afferent or sensory nerve, efferent or motor nerve and mixed nerve. What are the main components of nervous system? The main components of nervous system are brain, spinal cord and nerves. Into how many groups can the Nervous system be divided? Name each one. b. Peripheral nervous system with different types of neurons. What are the different types of neuron? Name each type giving its function. a. Sensory neuron: It takes the impulses from sense organs (receptors) to the central nervous system. b. Motor neuron: It takes the impulses from the central nervous system to the muscles (effecters). c. Inter neuron: It links sensory neuron to motor neuron. The nerve cell bears branches, one of which is longer and is protected by medullary sheath is called axon. Dendrite is defined as a small branch of the nerve cell which carries stimulation and reaction towards the spinal cord. The cells that transmit the message form one part of the body to other are known as ______. Which of the following carry impulses from various parts of the body to the brain or spinal cord? Which of the following is a long tube like structure that arises from neuron? ______ sends most of the impulses to the dendrites of another neuron. Any Questions on 'Introduction to Nervous System '?